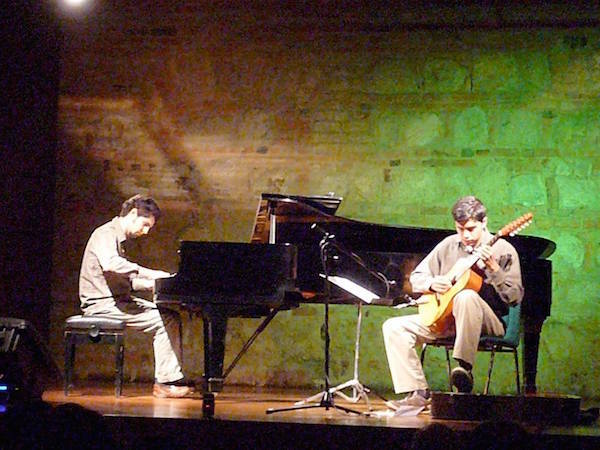 Originally from Bogotá Colombia, pianist Ricardo Gallo and guitarist Alejandro Flórez have been generating several projects that relate contemporary musical expressions to the musical traditions of their homeland. In this duo project, they present their own pieces inspired by the string music from the Colombian Andes. Alejandro Flórez plays in this project tiple and bandola, two traditional string instruments from the region. Gallo and Flórez explore the possibilities of improvisation departing from the sounds and compositions of this unlikely duo. Gallo and Flórez have presented their work in Bogotá, several venues in New York City, in Long Island (N.Y.), and in Ottawa and Montreal invited by the Embassy of Colombia in Canada. Their debut album “Meleyólamente” was recorded in August 2008 in Bogotá Colombia, mixed and mastered in NYC, and released in February 2009 under the new Colombian independent label Festina Lente Discos. It was among the best 10 CDs from Colombia in 2009 according to Semana Magazine. Gallo Florez Duo at Terraza 7 on Sunday July 5th, 2015, at 8:00 pm. No Replies to "GALLO FLOREZ DUO"